The CCSS stresses the need to support digital skills development. Teachers can facilitate this by embracing multimedia, empowering writers, and being creative with technology tools. The Common Core State Standards (CCSS) is a powerful set of expectations for student learning that has been adopted by districts across the country. One of the phrases associated with this document is college and career readiness. As we prepare students for life beyond the classroom, including digital tools in our instruction and making connections to technology in the real world is absolutely essential. Students of all ages need experience using technology and developing digital skills that can be applied to multiple tasks. If we truly want children to be college and career ready, schools must take thoughtful and strategic action to include technology tools in classroom instruction. The CCSS clearly states expectations for technology use as it applies to different content areas. These standards also give teachers the flexibility to incorporate a variety of strategies and resources. Educators can make decisions about how to address the Common Core, meet the needs of their students, and provide opportunities to strengthen digital skills. The English Language Arts (ELA) Anchor Standards of the Common Core state that students should be able to "[i]ntegrate and evaluate information presented in diverse media and formats, including visually, quantitatively, and orally" (CCSS.ELA-LITERACY.CCRA.SL.2). Students are bombarded by media outside of the classroom. They need to master how to use this information strategically and assess its value. As a classroom teacher, I shared multimedia clips to help students make meaning of information, and I held them accountable for the content presented. Using graphic organizers to synthesize information presented in a BrainPop video is one strategy that I used to create a purpose for viewing multimedia. You can have students support a claim and "go back to the minute" when analyzing a video in the same way that they'd "go back to the paragraph" when analyzing a short text. Students are also expected to "[m]ake strategic use of digital media and visual displays of data to express information and enhance understanding of presentations" (CCSS.ELA-LITERACY.CCRA.SL.5). Learners of all ages should be able to make meaning of multimedia as consumers and see the power of visuals as creators. Technology tools can help students create digital media. Depending on the task that you give students, they might make graphs with Numbers for Mac or a step-by-step tutorial with the screencasting app Explain Everything. Whether students are writing an informational report on ecosystems for their science class, a persuasive essay for social studies, or creating a tutorial on fractions for their math class, digital tools can empower writers. The anchor standards for writing ask students to "[u]se technology, including the Internet, to produce and publish writing and to interact and collaborate with others" (CCSS.ELA-LITERACY.CCRA.W.6). 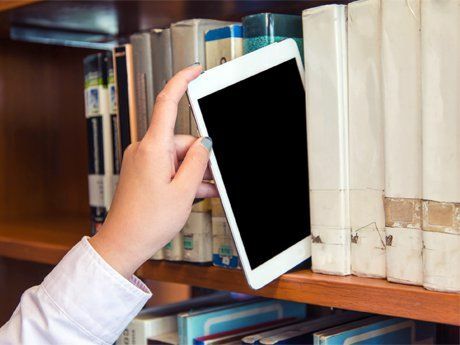 There are a variety of kid-friendly publishing tools that provide options for teachers looking to support Common Core instruction with technology. Adobe Slate and Book Creator are two powerful publishing apps for tablets that can be tailored to different writing types including narrative, opinion, and explanatory. The Common Core also expects students to "[g]ather relevant information from multiple print and digital sources, assess the credibility and accuracy of each source, and integrate the information while avoiding plagiarism" (CCSS.ELA-LITERACY.CCRA.W.8). 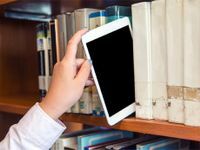 Developing the skill set to read from digital devices (including smartphones, laptop screens, and tablets) is a must for students inside and outside of the classroom. This is their new normal, and schools must include a balance of print and digital texts in their instruction. For my fifth grade students, I would connect a variety of informational text to QR codes for them to scan and access on their iPads. There are many great digital text resources for students at all grade levels. I used Scholastic News and Time For Kids in my classroom and would recommend exploring them. In addition to the ELA Anchor Standards mentioned above, teachers can tailor their lessons to meet grade-level-specific standards while thoughtfully integrating technology. This past month, I had the pleasure of visiting Courtney Pepe, a fellow Apple Distinguished Educator at the A. Harry Moore School in New Jersey. Teachers work to meet the CCSS and the needs of their low-incidence special education students by incorporating technology tools into their everyday instruction. I had the chance to watch students practice counting and sequencing using the programmable Sphero to move from one number to another across their classroom. Students were interested and focused on this math skill while using digital skills to interact with content. The Common Core provides expectations for student learning that can be tailored to a variety of classroom environments. Teachers can help students develop digital skills and incorporate technology while addressing the needs of their students. If we truly want students to be college and career ready, the thoughtful integration of technology into daily instruction is a non-negotiable.